Poet Dara-Lyn Shrager: I figured the monkey would make his way into the artwork. Artist Amy Meissner: The images—they remind me of the way I see my own childhood, in bursts and moments, precise objects and total misunderstanding. Poet Dara-Lyn Shrager: I find the fact that the monkey is larger than the children very interesting. Artist Amy Meissner: This changed a lot. I was looking to capture a moment within the piece, but it all became very heavy and frightening—this is a frightening piece of writing. I think the image I created is still frightening, but it’s couched in the ridiculous and saccharin. Perhaps this was my way of dealing with that fear, sort of sweeping it under the rug, but it’s there. You just have to do a double take to see the lump in the carpet. Or just trip over it. Poet Dara-Lyn Shrager: The poem seemed pretty dark to me when I wrote it. Seeing it accompanied by a piece of art that is fairly cheery made me consider the possibility that some might perceive this poem as less terrifying than I did. Artist Amy Meissner: I think I started wondering how surprised other people would be when they found it hanging out there in the world. 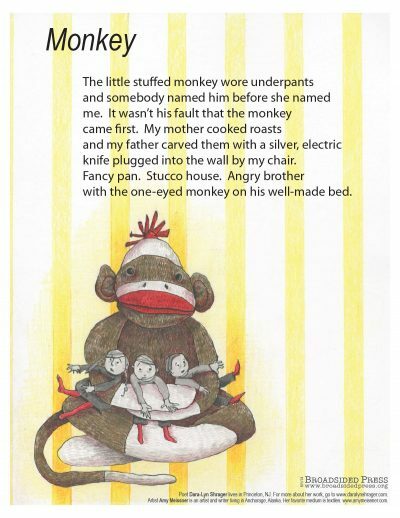 Here is this ridiculous monkey staring out at you and locked on these children, but then you read this powerful piece of writing that speaks to me of darkness. What one thinks one is about to read (something about a monkey?) isn’t necessarily what one will read. I think it’s a double whammy. Poet Dara-Lyn Shrager: I write ekphrastic poems from time to time. I guess if I am struck by something I see, I tend to write about it—be it a piece of art or anything else in the world. If the Broadsided collaboration were a piece of music, what would it be? Artist Amy Meissner: Dead Can Dance meets Robert Lopez and Kristen Anderson-Lopez. Or something equally disparate. Poet Dara-Lyn Shrager: As a matter of fact, yes! I edit the online literary journal. Radar Poetry (www.radarpoetry.com), and we are constantly searching out emerging artists whose works accompany our poetry selections. I have too many favorites to list here. Artist Amy Meissner: I’ve been researching Dorothy Caldwell’s textile art. I want to be her when I grow up. Poet Dara-Lyn Shrager: I just read Dylan Thomas in America by John Malcolm Brinnin because my son loved it and lent it to me. Artist Amy Meissner: Currently reading The Lotus Eaters by Tatjana Soli. Heavy. Poet Dara-Lyn Shrager: Since you asked: this is such a wonderful project. I feel honored to be a part of it. Poet Dara-Lyn Shrager is the Co-Editor of Radar Poetry (radarpoetry.com). She lives in Princeton, New Jersey. Her poems have appeared in journals including Ontario Review, The Comstock Review, The Greensboro Review, Pebble Lake Review, The Nashville Review, The Chaffin Journal, Harpur Palate, and others. Her chapbook, The Boy From Egypt, was published by Finishing Line Press in 2009. At lunch on Witherspoon St. in Princetown, NJ with my monkey! Artist Amy Meissner puts “Monkey” on board (well, on the gunwhale of) a boat out of water. We think it’s perfect placement.